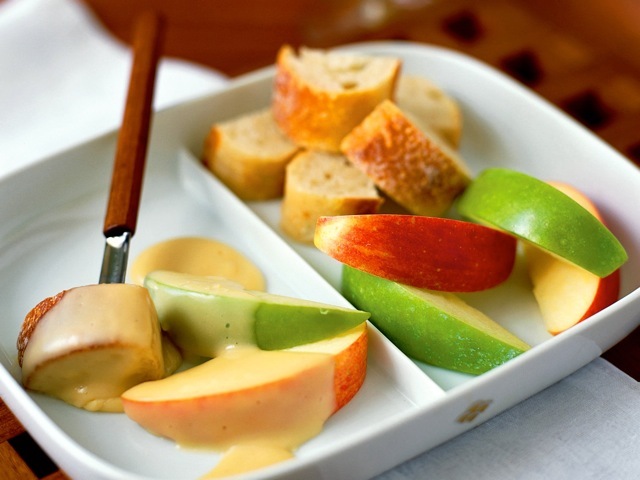 Apples — in the form of cider and Calvados — lend a double fruitiness to this fondue, which is slightly sweet. Lemon juice counters with a welcome piquancy. This recipe, based on the cuisine of Normandy, is delightful with crisp apple slices, Anjou or red-skinned Bartlett pears, and crusty sourdough French bread. Consider following the fondue with a light entrée such as trout amandine with chive-coated new potatoes. In a fondue pot over medium heat, heat the cider and lemon juice until bubbles form. Toss the cheese with the cornstarch until evenly coated, then add the cheese to the pot a handful at a time, stirring each time until the cheese is completely melted. Stir in the Calvados, mustard, and salt and pepper to taste. Keep warm over low heat. Serve with sliced apples, sliced pears, and crusty bread cubes for dipping.